Not that long ago we mentioned there were murmurings in the Palm office, going by the name of Nova. This would be their top secret OS that will be launched at CES, but we’ve just been given heads up on the new phone it will be launched on. According to this crime scene like sketch it will have a slide out QWERTY keyboard and be fully touchscreen. The hype is that it will be ‘iPhone like’, so I guess that means we’ll throw it in with similar copycats such as the Nokia 5800. 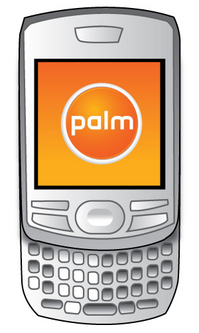 The word is that it will be sourced by HTC, as they’re responsible for the Palm Pro and that the applications will be comprehensive. Hmm, so iPhone mash up meets Android like apps? How original. Full details will be coming your way this Thursday!